I remember like it was yesterday. A deep and unexpected ache creeps over my heart as I look through the months, neatly condensed on my phone’s calendar, and count the days since the moment I gave my life to God. Three years, nine months and fourteen days. In the giving, I’ve ended up living on the other side of the planet where the time change creates at least some uncertainty in my calculations. My 93-year-old grandma recently shared her testimony with me as I sat on the couch with her during a recent visit home. My family comes from Lutheran and Catholic traditions. I’ve always had an awareness of the way my grandma seemed to experience religion deeper than anyone else I knew growing up. As a matter of fact, she was never “religious” about any of it. She simply, deeply believed. As she still does. My grandma was the one who sometimes got us to read the bible with her. She would occasionally take me and my siblings to McDonald’s and give me a hard time for liking ketchup, but not tomatoes. The difference seemed obvious to me, but she wasn’t content until she challenged me on this inconsequential detail. I have to give her some credit for teaching me to question things once in a while, even if it is a characteristic I was surely born with. Everything else about me, she accepted wholeheartedly. She delighted in our quirks. She’s the one that knew how to cry out to God in the worst of times. When her adult son, Danny, died, I witnessed her cry out in church that first Easter Sunday after his death. Even though her cry was quiet, it came in a way I had never seen expressed in church. Purely. I was sixteen years old and had gone to church my whole life, yet it was the first time I had ever seen anyone cry there. It was just three days after his death. I wasn’t yet a real believer. I was mad at the church, its hypocrisy and lack of anything that offered true meaning to me. I didn’t understand what it had to offer anyone until the day I saw my grandma cry. My angsty crusade against the church ended in that moment. Even while the entire congregation around us stood, sat and kneeled on command—without emotion and as though on repeat—I saw something new that day. She needed God. And, for her, I felt he was there. Danny took his own life on Good Friday. There was nothing good about it. I’ll never forget the deep throated scream of my cousin when he received the news. We were best friends. Teenagers sitting around a bonfire when our family came out to find us in the woods. That moment still pierces me. My cousin, Pete, screaming “NOOOOOOOOO!” I don’t remember who was there. I just remember the way it shattered the night sky in a way that has never left me. It stuck with me all the way into my own moment, many years later, standing in a different set of woods. Alone except with my dogs and the horses not too far away. A fresh snow had fallen. It was morning and I was receiving news over the phone that Carl was gone. I screamed that same singular, heart-wrenching, impossible word into the cold air…over and over and over again. Nothing but snow and worried dogs and Carl’s sisters on the other end of the line to hold me against this impossible reality. Three years, nine months and fourteen days. This morning, my fascination lies not in how many days it’s been since Carl lost his life, but how many it’s been since I so willingly let God have mine. So much all at once. Just a handful of painful hours after receiving that phone call. There, at Carl’s family kitchen table. I’ll never be sure if I gave my life or it was taken. Life force both came into me and left me. Simultaneously. I didn’t yet know anything. My only awareness was that the quality of light in the transmission was rich and unmistakably made of God. Outside of that, there was only a shearing, unbelievable pain that would last for many, many months that stretched into years and, although eased with time, will never truly and totally leave me. balanced only by the beauty of God Himself. What can I embrace fully as my own? The dogs wake up. They are happy. They are always happy with morning. I force myself to sit up, giving each one of them the attention they so eagerly give. I let them outside and feed them. I make coffee and sit down with my journal. I’m not yet done seeking God. Surely, He will meet me in these pages. I’m persistent. I won’t give up. I sit down at the big dining room table that is often filled with people. Right now it’s just me and piles of seed packets and books and papers filled with the day’s projects. After taking one sip, I spill the whole cup of hot coffee on myself. Damn, it tasted perfect. Even the dogs know to step back a few feet until I clean it up, make a fresh cup and sit down again. The new bible sitting next to me is now wet and stained. My journal too. Fighting irritation and tears, I turn on some music. The first song that plays is “I Am Yours” by Ginny Owens. The floodgate opens and the tears begin to fall, plump drops on already wet paper. Not the manageable type of tears, but the kind that requires half a roll of toilet paper to wipe my eyes and blow my nose with. Wave after wave, it just keeps coming. I ask myself: What did it mean to give my life to God? Three years, nine months and fourteen days. How could I have ever known that giving my life away would come with so much uncertainty? Everything was gone and so I gave it ALL. But I never knew that later on it would look like this. I didn’t think about the fact that I would still be me at the center of it all. For a long time, I wasn’t me. I wasn’t anyone; I was simply grief-stricken. And then…slowly, the world started breaking back in. In both good circumstances and bad, I was forced to participate with my life, a life no longer my own. The unchangeable truth of the matter is that I wouldn’t trade this way of living for anything. God has reminded me in sweet and sometimes staggering ways that it’s not about me. But then what do I do with me? The parts of me that aches and desires and grows weary and lonely, overwhelmed and confused? If I gave my life to God, when was it that I began thinking things would or should belong to me? Carl died. For those of us who knew and loved him, he was our hero. He was larger than life. The last one that any of us thought would die. The things I held dear in my secular life fell like sand through my fingers. Why would I ever think God owes me differently now? And so, my questions turned to prayers. It didn’t take long at all before I came to the only clarity I needed. I know God loves me. I can feel it in all of these details…even if I don’t understand. Sometimes, especially, in the things I don’t understand. I remember and in that remembering I surrender. Once again. A million times over. My God, take it all. It is worth nothing, if not for You. Last night we broke new ground, expanding our gardens beyond our original design. 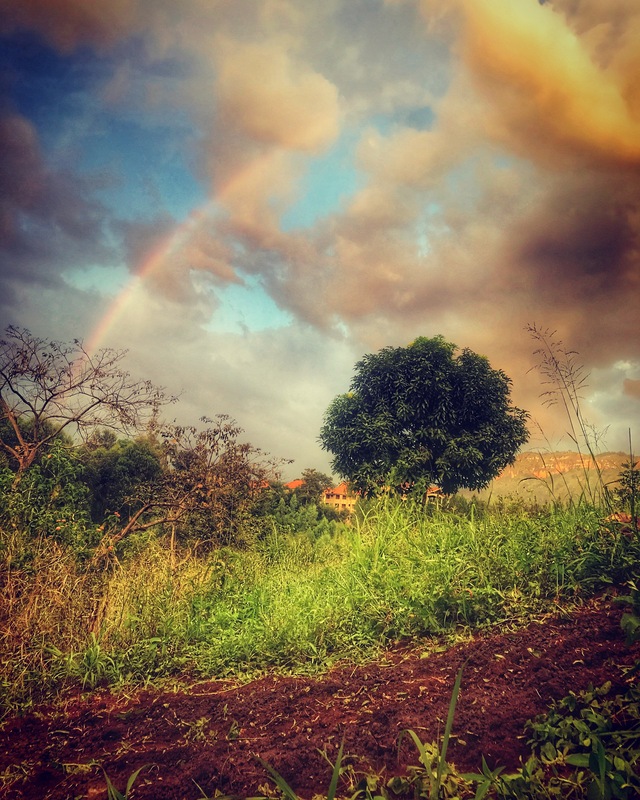 We planted corn and squash and, just as we finished, rain and then a rainbow blessed us with a promise in our new planting. This place amazes me. We do everything by hand here. We don’t have tillers or a tractor or any of the modern conveniences of home. Instead we have a Ugandan style hoe and some jerrycans to haul water from the river below. We have the strength in our bodies and an unwavering faith in our hearts. We are led by the small windows of cooler temperatures in the mornings and evenings of each day. We worked until night fell and, in the coming week, will continue planting the overflow of kale, cabbage, and okra seedlings into this new space. We’ll plant onions too. Lots of them. As many as possible. We will propagate plants and share seeds. We will tend to this patch of earth that God has given us and be amazed by the miracle of all the promise that comes into being. This morning I awoke from a dream in which we were taking all the overflow from the garden and feeding it to the elderly. There were many of us and we went out into communities looking for those who were alone and unable to care for themselves. For some, we even made sure they had cookers and charcoal. We also began to cook. There were so many people who came and it took on a life of its own. After all, that is often how the best things happen. Several hours later and the dream still feels as real as my hands did while planting those seeds.